Find a great sale price on this 2019 Ford Fusion S at Value Ford in Elma Washington. This 2019 Ford Fusion S is located at our Ford dealership in Elma. We also serve the cities of Aberdeen, Montesano, Tumwater, Hoquiam and Olympia. 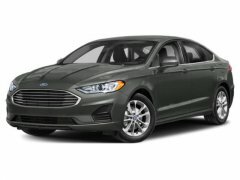 So if you're looking for a great price on this 2019 Ford Fusion S or just looking to get an auto loan for the vehicle you want... you've come to the right place! Value Ford. Listed sales prices include all standard Factory to consumer rebates such as: Retail Customer Cash, Special Customer Cash, Bonus Cash, Ford Credit Bonus Cash (Must finance through Ford Motor Credit to receive, on approved credit), Trade-In Assistance Cash and Other Bonus Cash. Other rebates may be applicable such as: College Grad Cash, Lease Conquest Cash, etc. See Dealer for complete details and qualifications. Not all customers will qualify for Ford Motor Credit financing. NAV, Cross-Traffic Alert, Brake Actuated Limited Slip Differential, Blind Spot Monitor, Lane Keeping Assist, P0G02 - S CO-PILOT. EPA 31 MPG Hwy/21 MPG City! Blue Metallic exterior and Medium Light Stone interior, S trim CLICK ME! KEY FEATURES INCLUDE Back-Up Camera, Keyless Start, Lane Keeping Assist, Cross-Traffic Alert, Brake Actuated Limited Slip Differential, Blind Spot Monitor. Keyless Entry, Steering Wheel Controls, Child Safety Locks, Electronic Stability Control, Bucket Seats. OPTION PACKAGES P0G02 - S CO-PILOT Ford Co-Pilot360 Assist w/SYNC 3, SYNC 3 Communications & Entertainment System, enhanced voice recognition, 2 4.2" driver configurable LCD displays in instrument cluster, 8" center LCD capacitive touch-screen w/swipe capability, AppLink, 911 Assist, Apple CarPlay, Android Auto and 2 smart charging USB ports, Voice-Activated Touchscreen Navigation System, pinch-to-zoom capability, SiriusXM Traffic and Travel Link w/5-year prepaid subscription, Not available in AK/HI, SiriusXM audio and data services each require a subscription sold separately, or as a package, by SiriusXM Radio Inc, If you decide to continue service after your trial, the subscription plan you choose will automatically renew thereafter and you will be charged according to your chosen payment method at, ENGINE: 2.5L IVCT (STD), BLUE METALLIC, TRANSMISSION: 6-SPEED AUTOMATIC (STD), EQUIPMENT GROUP 100A. Ford S with Blue Metallic exterior and Medium Light Stone interior features a 4 Cylinder Engine with 175 HP at 6000 RPM*. BUY FROM AN AWARD WINNING DEALER Spring Clearance Sale On Now! Call Or Click Today! New-Advertised sale prices are after all factory rebates including retail customer cash, special customer cash, bonus cash, ford credit cash, trade assistance cash, and other bonus cash. Customer may qualify for additional incentives.